He’s been shot, shot at, jailed and imprisoned. Now, the North Side rapper known as Bang Da Hitta is charged with murder. 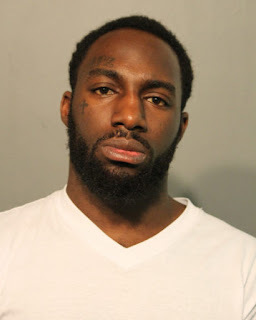 Chicago police this afternoon confirmed that 27-year-old Keith Hayer has been arrested and charged with one felony count of murder in connection with the November 2017 slaying of 18-year-old Desahwn Johnson in Uptown. Hayer is due in bond court today. Shortly after 6 p.m. on November 13, Johnson was gunned down in the 1200 block of West Leland. His body was found lying amongst more than 30 shell casings that stretched for two city blocks. He was pronounced dead less than an hour later at Advocate Illinois Masonic Medical Center. Johnson’s Facebook page was filled with images of him posing with large amounts of cash, weapons, and drugs. He was a member of the Hoola Gang sect of the Black P-Stones street gang. Less than two weeks before Johnson was killed, CWBChicago reported exclusively that cops believed Hayer played a role in a double-shooting near Clark and Leland in Uptown on November 1. Hayer had been arrested in Lakeview after police allegedly saw him run from a van that was used to transport the November 1 shooting victims to Masonic, according to a police source. Shell casings were found inside the van and in the 3000 block of North Sheffield, but no gun was recovered. No charges were ever filed in the case. On August 16, 2017, CWBChicago reported exclusively that Hayer himself had been shot in Uptown. More recently, Hayer was shot twice on March 28 in the 1300 block of West Estes in Rogers Park.